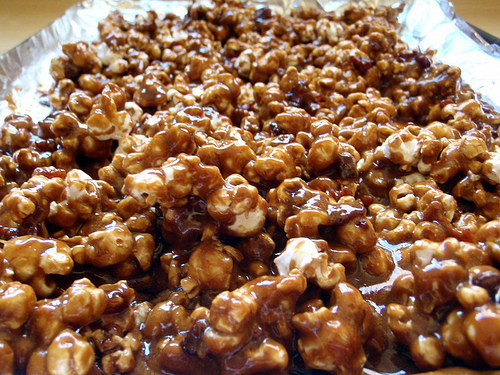 Classic caramel popcorn! Butter, Sugar and Corn make for a killer combination that is brought out beautifully in this recipe. Why go to a mall or theater to get them when you can easily pop-them up at home? Enjoy this sweet and crunchy treat at home today! Note: If you have only salted corn kernels, do not add extra salt in the mixture. Pop the corn in a microwave, a pan with a lid or in a pressure cooker without whistle. Make sure to grease the pan or cooker with butter before popping. Remove any un-popped corn. Melt 1/2 cup butter in a saucepan over medium heat and add the sugar, corn syrup and salt to it. Stir the mixture and let it come to a boil. Boil for 5 minutes and then remove the pan from heat. Preheat the oven to 120 degrees C or 250 degrees F.
Add the vanilla essence and also the baking soda in the butter-sugar mixture. Stir nicely. Spray cooking spray in a baking dish and spread the pop-corn in it. If the pop-corn has completely cooled down, place the dish in the oven for 5 minutes to warm them up. Now pour the butter mixture over the pop-corn and toss to coat them with the mixture nicely. Spread out an aluminum foil paper and spray cooking spray on it. Remove pop-corn from the oven after 45 minutes and spread them out on the foil paper. Allow them to cool down and then break them into pieces. Store in airtight container or serve instantly.